As I get ready to go through the final steps of making the amigurumi rag doll I begin to think that she would look good with curly hair. I haven't done it before so I want to try out some different techniques to see which ones I prefer, and so my little experiment begins! 1. 2. and 4. 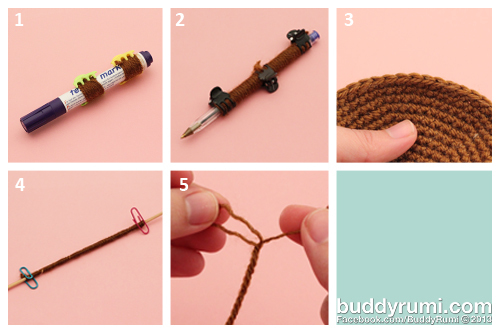 Wrap the yarn around a cylindrical object and hold it with a mini hair clip, paper clip... Wet the yarn with water. Squeeze the yarn to remove excess water. Let it dry completely and slide the yarn off of the cylinder. I used objects with different thicknesses to experiment with the different looks. 3. Work the yarn you want to use for the hair with single crochet. Wet the yarn with water. Squeeze the yarn to remove excess water. Let it dry completely and unravel it. 5. Split the finer threads that make up the yarn. For the techniques 1 through 4 use 100% wool which holds the curls better. You can also add a little bit of white glue after wetting the yarn. As expected, the yarn wrapped around the marker gives us loose waves instead of curls. The yarn wrapped around the pen still gives us waves, but a little bit tighter. The unraveled yarn gives us tight and messy curls. Wrapping the yarn around the skewer gives us a really tight and tidy curl. Splitting the yarn also gives a really tight curl, and even though the individual hairs are thinner it has more volume. Well, now I've done it! Which one do I use? I prefer the tighter curls, but do I go with messy, tidy or voluminous? 1. Insert the hook under the stitch where you want to secure the yarn. 2. 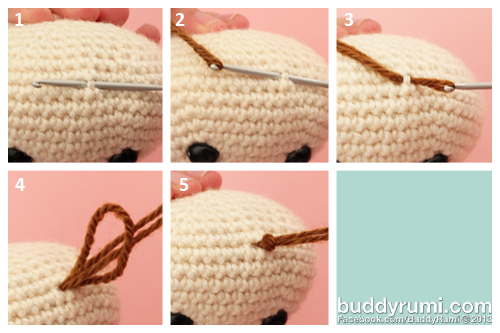 Grab the yarn (folded in half) with the hook. Remember to cut the yarn in pieces with two times the final length of the hair. 3. 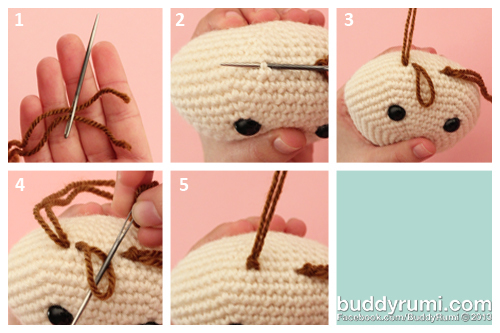 Pull the yarn until you have a loop on the side of the hook. 4. Make the ends of the yarn go through the loop. 5. Pull. The yarn is secured. 1. Thread both ends of the yarn. Remember to cut the yarn in pieces with two times the final length of the hair. 2. Insert the needle under the stitch where you want to attach the yarn. 3. Pull until you have a loop. 4. Insert the needle into the loop. I prefer to use this method because I feel it is more fluid and faster. I also feel it make it easier to pick up the stitches. What do you think? Loose, tight, messy, tidy or voluminous? Which look do you prefer?